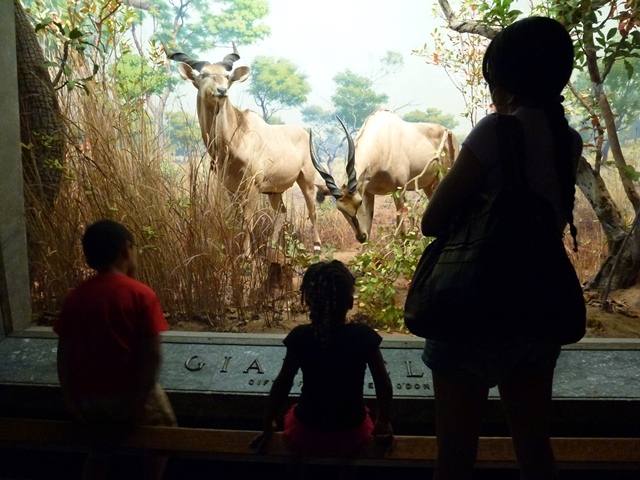 “African Mammals!” many Family Center children answered, when asked about their favorite exhibit at the American Museum of Natural History. Volunteers from Goldman Sachs Community TeamWorks joined 50 TFC children and family members to explore the vast and diverse halls of the museum together last Friday. Participants looked up in awe of the 94-foot-long blue whale, suspended from the ceiling in the Hall of Ocean Life, snapped photos next to Stegosaurus and Triceratops fossils in the Dinosaur Wing, and marveled at life-sized elephants, lions, and gorillas in the Hall of African Mammals. The day culminated with Flying Monsters, an IMAX movie about a group of reptiles that ruled the skies millions of years ago. The Family Center extends many thanks to Goldman Sachs Community TeamWorks for making this special event possible for the children and families we serve. Corporate volunteer events provide vulnerable families with access to New York’s cultural richness. To become a corporate partner by hosting a volunteer event for The Family Center, please contact the Development and Communications Department.